Osage City Elementary School fifth-grade teacher Jeff Edwards watches as his students, from left, Misty Morgan, J.D. Schoepflin and Cody Reed, receive instruction on planting a tree from Osage City Tree Board member Rhonda Newland Monday south of the school. 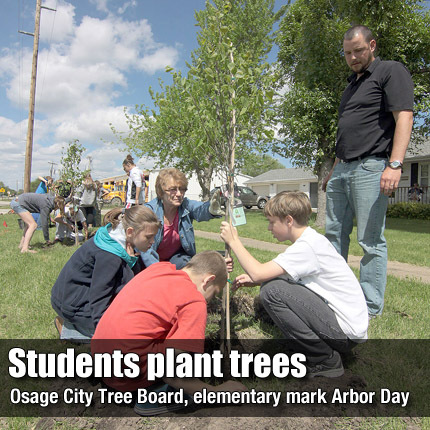 Students planted three redbud and five Royal Raindrop Crabapple trees in honor of Arbor Day, traditionally celebrated on the last Friday in April in Kansas. Each of the students also received a Shantung maple tree seedling to take home to plant.